Taormina (Italy) (AFP) - "A liberal fantasy dream sequence", "a bromance," "insanely romantic". The Internet was abuzz Friday with pictures of French President Emmanuel Macron and his Canadian counterpart Justin Trudeau schmoozing at the G7 summit in Sicily, strolling through flowered walkways and chatting against the backdrop of a sparkling blue Mediterranean sea. "Apparently Justin Trudeau and Emmanuel Macron flew to Sicily for their wedding photoshoot," netizen @sherlockify joked on Twitter. The reaction to the telegenic pair's encounter in the picturesque, hillside town of Taormina, immortalised by Macron himself who tweeted a video of their meeting, provided some light relief from a summit otherwise devoted to thorny issues such as climate change and the threat of extremism. "The Franco-Canadian friendship has a new face," Macron tweeted after sitting down for talks with Trudeau and taking the now famous stroll. "@JustinTrudeau, it's up to us to take on the challenges of our generation!" "Sitting down with @EmmanuelMacron for the first time, talking jobs, security & climate -– looking forward to more conversations, my friend," Trudeau responded on Twitter, posting pictures of both smiling, shaking hands, and looking out over the Mediterranean, their dapper suit jackets billowing in the breeze. Trudeau, 45, is popular with liberals worldwide for his commitment to fighting climate change and easing the refugee crisis -- in stark contrast to the United States, Canada's powerful neighbour. Macron, 39, has only been in power for 12 days but enjoys similar kudos, particularly abroad where he has been compared to Trudeau. 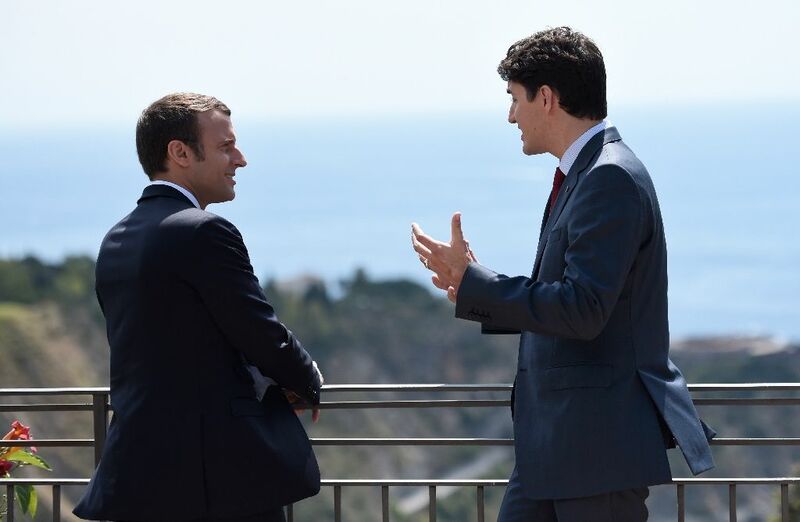 "This image of Trudeau and Macron in Sicily is right out of a liberal fantasy dream sequence," tweeted Dhruva Jaishankar, an expert on foreign policy at the India section of the Brookings Institution think tank. Others were even more explicit. "Le swoon, le sigh," tweeted netizen MissMary, above a photo of both leaders in apparent earnest chat. 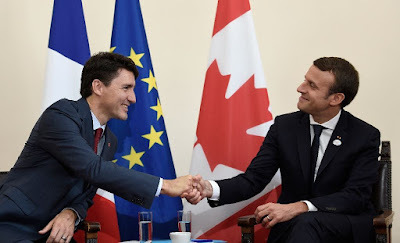 "Is there a budding bromance between Macron and Trudeau? Two hunks!" added @MaureenRamsden.